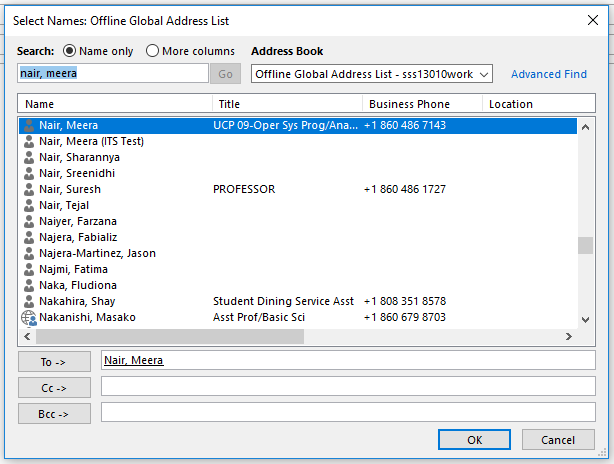 Faculty and staff who use Outlook for email can remove incorrect or outdated email addresses that are suggested by Outlook’s autocomplete tool. Outlook remembers every address you type in a To, Cc, or Bcc field. When you begin typing in these fields, it will makes suggestions based on past entries. This can be problematic if the address is incorrect or outdated, and to avoid sending the message to the wrong recipient or an undeliverable address, you should remove it from the cache. Begin typing the email address into an address field. When then name appears in the list, click the X next to the address. The address book should pop up. Search using the Last Name, First Name format. Select the contact and then click To… Finally click OK.